Christian Schallert's parents thought he was crazy when he first showed them the tiny apartment you will see in the video below. At only 258 square feet (24 square meters), this apartment hardly seems large enough to serve as a comfortable home, but Schallert did an amazing job of designing the space to feel like it is immensely bigger than the square footage would suggest. The apartment used to be a pigeon loft at the top of a building in Barcelona's Born district before architect Barbara Appolloni transformed it into a remarkable tiny home. Schallert says that the design was inspired both by the space-saving furniture that can be found on most boats and the "clean lines of a small Japanese home." What is truly remarkable about the design of this apartment is that the space can change completely because of the mobility of its features. Everything from the kitchen, to closets, to the bed is hidden within the walls of the apartment and panels must be moved to access each of them. Schallert claims that living in an apartment of this type is beneficial for his active personality - he is almost always moving something about the room! Though Schallert's apartment is one tiny room, it has the ability to easily transform from kitchen, to bedroom, to dining room. This kind of utility is undoubtedly key to being able to comfortably live in such a small space. We at Shield Spirit were amazed by the transformation that Schallert and Appolloni were able to pull off. This sleek, modern apartment provides all of the necessities of a home, and the practicality of fitting it all into 258 square feet makes it the perfect model for living simply! 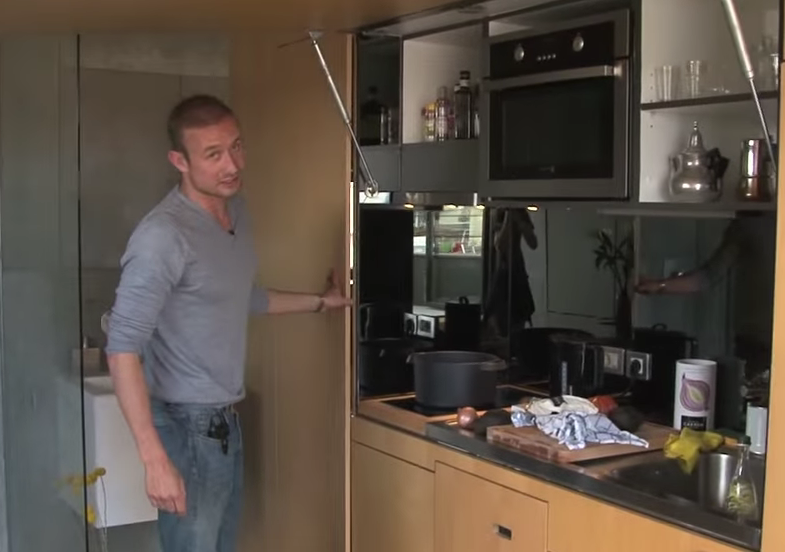 Have you ever seen an apartment or tiny home designed like this?